Initially developed in Verizon labs, Compendium is a powerful open-source mindmapping and data organization tool. It’s currently offered and supported by the Compendium Institute. 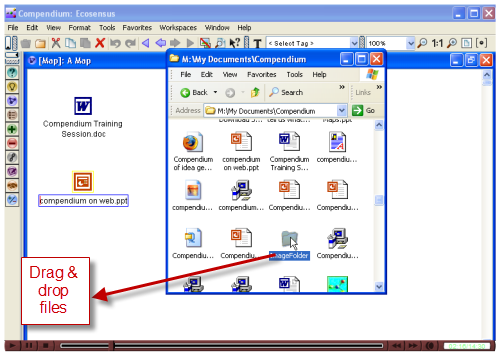 Compendium has an easy-to-use drag-and-drop interface that allows you to create map nodes connecting files (pdfs, images, PowerPoint documents, WORD documents, etc) and/or folders. 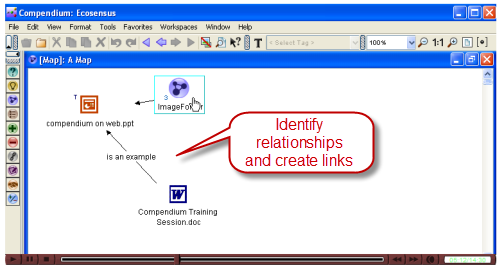 In addition to creating links between items you can also name links to define relationships. An interesting feature of Compendium is the ability to drag and drop urls and even text snippets from the web onto your map dashboard. If the text is too large, you can always move it into a note or “detail” associated with your map node. Finally, Compendium is also built to facilitate reflection and dialogue. You can add text questions, ideas, and responses to discussion nodes and use the tool’s built-in icons to distinguish these nodes. To learn more about Compendium, view this video introduction. 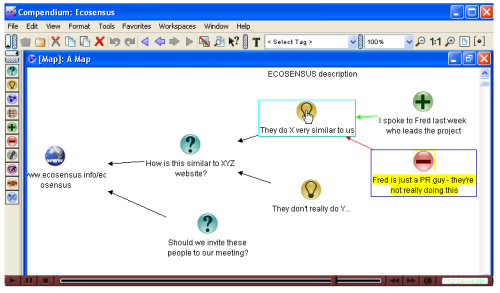 Compendium offers many of the bells and whistles that other mind mapping programs offer, but it’s built around the idea that your documents/files as well as web information and images are all part of your mental schema, so it’s integrated with your desktop.